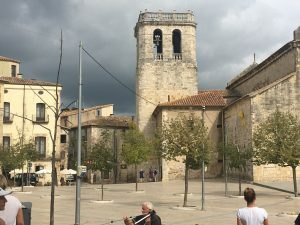 Today we went by bus to Besalú, half an hour from Girona. We would actually go to the beach for a seascape, but there would be thunder and rain that day according to the weather forecast. 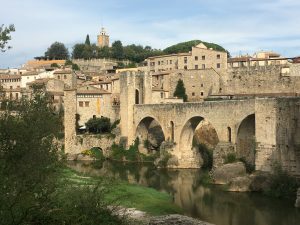 Besalú is a small town, with walls as shelter and a stone bridge with gates over a small river. Joseph demonstrated close to the water. 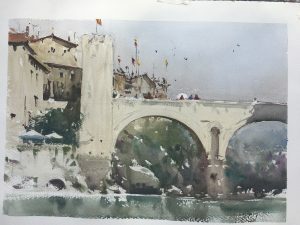 He painted the tower and some of the bridge that led into the city. He pointed out that you don’t have to paint everything around you, paint what you see without moving your eyes. He sketched quickly, without lifting the pen too much. He painted a light layer over almost the entire image and let it dry. Then he finished everything from left to right. It is important not to jump here and there when painting. The whole picture was almost clear when he finally painted the green water. Flowing and fast, and everything got to flow together. It looked very good. Then we started painting nearby. A man came to me and spoke Spanish. I did not understand a word of what he said but nodded nicely when he spoke and gestured. After a while, I got his card and he went away. One of the participants in the course was able to speak Spanish and had heard what the man said. She later told me that the man had wanted to buy my painting. 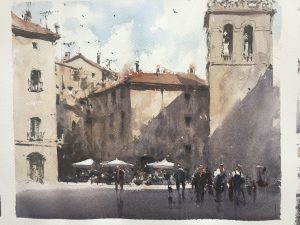 A large square in Besalú was what Joseph wanted to paint next. He removed the trees, they were ugly he sad. At first it looked a bit dirty but after a while the picture grew. 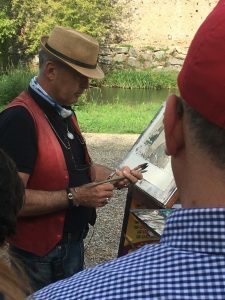 He emphasised the importance of checking the moisture on the paper and on the brush. The paper may be dry, damp, moist and wet. That in combination with how much pigment you have on brush is very important. When you can handle it, you can paint, he informed us. We had a very short time to paint ourselves. 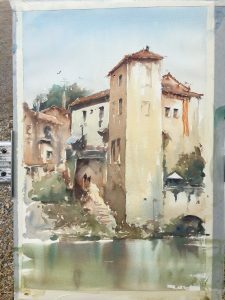 My tip to you as joining a workshop like this is to paint small pictures, quartz sheets, or less. Then you may have time to complete them. Fish was swerved as main course.